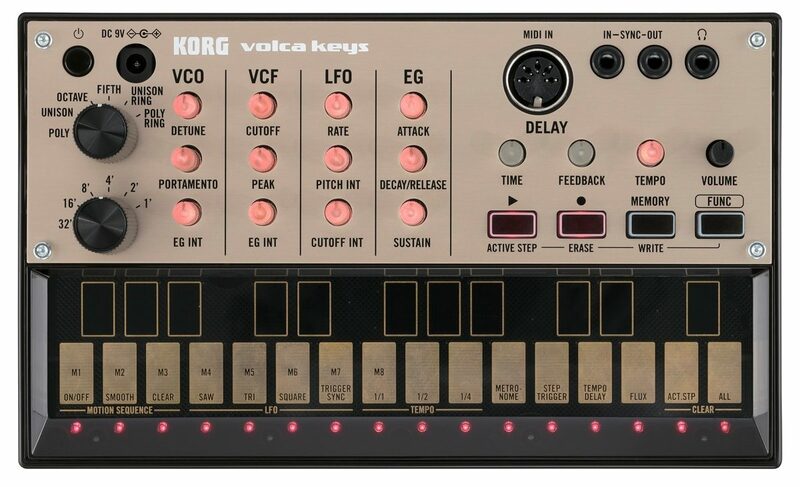 The Korg Volca Keys analog loop synthesizer is part of Korg's Volca series -- a lineup of EDM production tools that also includes the Volca Beats rhythm machine and Volca Bass synthesizer. Following in the footsteps of the monotron, monotribe, and MS-20 Mini analog synthesizers, these powerful and fun-to-use true-analog devices deliver a diverse array of fat sounds that can be obtained only from an analog synthesizer. 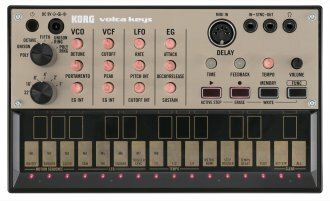 The ideal introductory synthesizer, with a simple -- yet powerful -- polyphonic analog sound engine and loop sequencer, Volca Keys adds a chapter to the long and storied history of Korg's analog synthesizers. This 27-key analog lead synth delivers unbelievably powerful sound in a compact body. Starting with a filter section that uses the circuitry of the legendary miniKORG700S (1974), it delivers astonishing sound that takes full advantage of Korg's half-century of know-how in circuit design. Each Volca synth is equipped with sequencing/recording capabilities for intuitively generating performances. Multiple Volcas can be used in tandem via the vintage-style sync in/out, and with your favorite DAW software or MIDI keyboard via MIDI In. Battery operation and built-in speakers mean that you can conveniently play anywhere and anytime. These are the next-generation analog synthesizers, bringing you the ultimate sounds and grooves with ease and depth. Whether used together or by themselves, the Volca series is poised to inject true analog power into any performance or studio setup! SYNC jack and MIDI IN connector allow synchronized performance with multiple units or with your DAW. By using the sync jack you can enjoy synchronized playback with multiple volcas or with a monotribe. You can also use the "SyncKontrol" iPhone app to wirelessly control tap tempo, swing settings, and synchronized playback with iOS music apps via WIST. MIDI IN connector: Synchronize with other devices, as well as play the volca from any MIDI keyboard. You can also send note messages from your DAW and use the Volca as an analog sound module. Self-tuning function: Until now, the problem with analog synthesizers has been that the pitch would drift over time, or because of changes in temperature. Volca solves this by providing a Self-tuning function that constantly tunes the oscillators. You'll never need to tune during a performance, or wait for the pitch to stabilize after turning the power on. Compact size, battery power and built-in speaker: With its small size, battery operation, and built-in speaker, it's easy to take the volca anywhere and perform any time.